The Kingston DataTraveler ReadyBoost is certainly an impressive USB flash drive. Behind its innocuous silver exterior lie really fast flash memory chips. They allow both the 1GB and 2GB models to achieve sequential read and write speeds which we rate at 90X read and 86X write. It was also fast as small files reads and writes, recording some of the fastest throughputs we have seen. In fact, the 2GB model was the fastest USB flash drive at small files writes that we have seen, bar none. As far as Windows Vista's ReadyBoost is concerned, both drives passed the test. However, our own tests did show that only the 1GB model passed the random read speed requirement. Even then, its performance was far from Kingston's claims. Perhaps our tests were too strenuous because Windows Vista readily accepted both drives for use with ReadyBoost. If you are looking for a fast USB flash drive that supports ReadyBoost, you should definitely consider the Kingston DataTraveler ReadyBoost, especially the 2GB model. 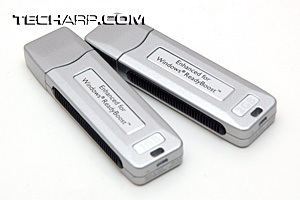 It is especially fast at writing small files, which flash drives have always been extremely weak at. Its larger capacity would also make it a more compelling drive to buy. However, 2GB isn't really all that big. Many other manufacturers already offer capacities of 4GB, 8GB or even 16GB. Too bad Kingston doesn't currently offer those capacities with the DataTraveler ReadyBoost. If you require a larger storage capacity, then you will have to look elsewhere. As far as bundling goes, Kingston is spartan which is pretty much the industry standard practice these days. Still, we would have preferred a full lanyard, instead of a mini keychain lanyard. But that should not be a deal breaker. Just remember what this is all about - a fast USB flash drive that supports ReadyBoost. Tack on the 5-year limited warranty and you have a really attractive USB flash drive.